Sometimes nature plays games with local farmers. And they don't always like it. Sarah Bean of Arctic Organics says last week's weather had its ups and downs. "From heat wave to wind-battered — this is a season of growing challenges," she says. "The heat has inspired early heading up in the broccoli and cauliflower, and the wind is blowing the heat-weakened plants over. Good thing we have many eggs in many baskets, so to speak." Mark Butler says the warm weather means that "we will soon be approaching peak produce time at the Spenard Farmers Market." And says Alex Davis of AD Farm: "The veggies sure loved the sun last week, so things are looking good for the market this week." And as summer continues to progress, new markets are still springing to life. This week, the Wednesday South Anchorage Farmers Market joins the lineup. Barbara Landi says the initial midweek South Anchorage market at the Dimond Center will feature a half-dozen vendors, including Glacier Valley Farm, Earthworks Farm, Stockwell Farm and Mat Valley Meats. Landi says Saturday's market will be full of fun. "Farm products in abundance this week continue to be the green leafy types including lettuce, kales, chards and various herbs," she says. 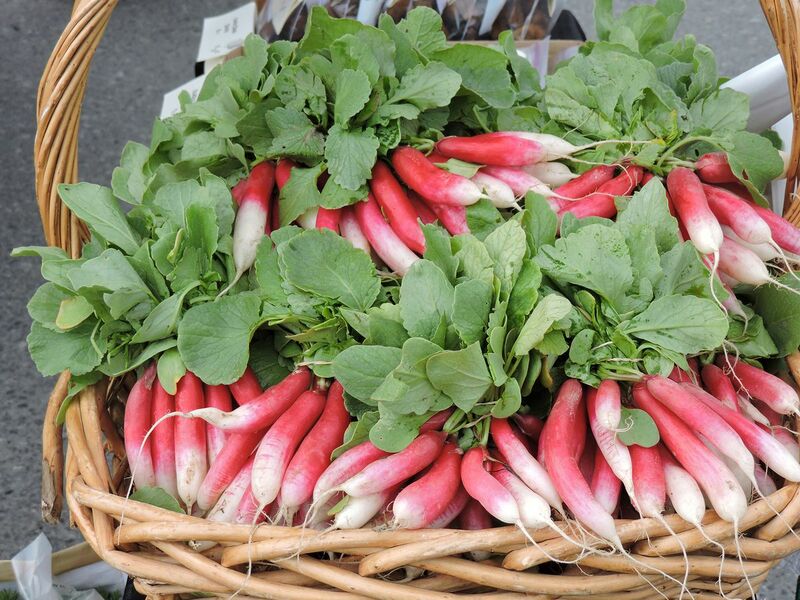 "Since Saturday's market happens to fall on Bastille Day, it's especially appropriate to gather up some French breakfast radishes, a specialty of Earthworks farm and also available from several other vendors. "We love it when our vendors trade and share each other's products. 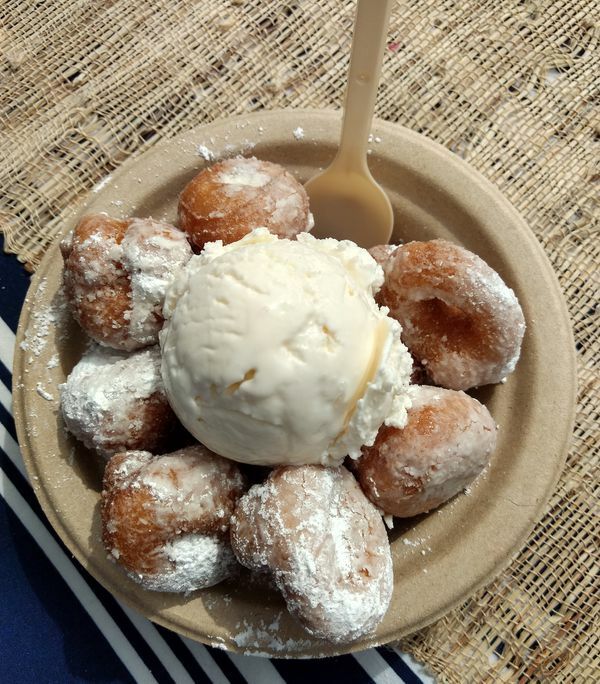 This is happening with Wild Scoops ice cream and newest vendor Little Dipper Donuts. You can now have a plate featuring a yummy scoop of your favorite flavor ice cream sitting on a bed of warm and sugary mini-doughnuts!" Other vendor highlights include Far North Fungi with a variety of mushroom options; Beach Tribe Soda with a non-alcoholic ginger beer; Rempel Family Farm will have a variety of vegetables, including chard, dill and cabbage all new this week; and Farm 779 with their first peony blooms of the season, which Julie Meer describes as "beautiful blushing pinks fresh from the field." Bean says lots of new veggies are appearing at the Arctic Organics stand this week, including zucchini, snow apple turnips, rainbow chard and mustard greens. Among the other veggies are broccoli, cauliflower, kale, spinach, Easter Egg radishes, greens mix, baby lettuce mix, escarole, pac choi, rhubarb, arugula, leaf lettuces, chives and basil. Other vendors include AD Farm, All About Time, Brown Dog Farm, Ed & Tina's Kraut & Pickling, Happy Valley Chickens' eggs, Mom's Garden, Seldovitch Farm, Shaggy Mane Shroomery, Stockwell Farm, Sun Fire Ridge, Turkey Red Café breads and treats, VanderWeele Farm and Vang Family Garden. Shrimp, strawberries, greens, zucchini and maybe even first-of-the-year potatoes will be part of the Muldoon market, which had more than 40 vendors last week. Lesley Dinkel of Dinkel's Veggies says to "come early" for those new potatoes. They also will have zucchini, lettuce, broccoli, tomatoes and rhubarb. The Dinkels will also be at three spots on Wednesday: Northway Mall Wednesday Market, Wasilla Wednesday Market and Wasilla Lake. Other vendors include BaLesca's Brothers, Subba Gardens, Arctic Wonder Marketplace, Fresh International Gardens and The Shrimp Guy, with more than just shrimp. Mark Butler shares that with the wonderful weather we will soon be approaching peak produce time at the Spenard Farmers Market. Butler says some of the vendor highlights this week will include: Chugach Farm with fresh snow apple turnips, cucumbers, Napa cabbage and kombucha; Wildrose Harvest and Midnight Sun Farm with honey and jelly; D&L with 12 varieties of pickled veggies; Four Tern Farm with field greens, breakfast radish, tomato, eggs and grass-fed beef; Dinkel's Veggies with broccoli and two varieties of zucchini; and Coddle and Cosset with hand-crafted chocolate. Davis says he will have salad mix, beet greens, kale, spinach, rhubarb and last year's potatoes at the market inside the newly renamed Midtown Mall. Davis will also have a variety of pork cuts, eggs, raspberry jam, pumpkin butter and apple butter. Joining the Center Market on Saturday is Fat Corgi Confections with chocolate covered sea salt caramels, chocolate turtles, peanut butter cups, chocolate covered papaya and chocolate bark.